Marvel’s second post-Avengers film is just what a Marvel film should be. It makes you laugh, it makes you cry (sometimes in the same scene) and it leaves clues to future Marvel productions (Avengers 2 and 3 anyone?). Despite the change of director from the first film, Thor: The Dark World is an exciting ride that keeps audience members on their feet until the very end. The film begins in the same manner as the first with Odin (Anthony Hopkins), Thor’s father and King of Asgard, lending his voice to tell an ancient tale of an evil race called the Dark Elves led by Malekith (Christopher Eccleston). In the tale, Malekith seeks a dark substance known as the Aether. Asgardians led by Odin’s father and predecessor, Bor sweep in and save the day. Malekith was going to use the Aether to absorb its power and, we can assume, take over the nine realms. Bor and the Asgardians defeat Malekith and the Dark Elves and confiscate the Aether, locking it away somewhere no one will find it. Enter Loki, who is in chains at Odin’s feet, to answer for his crimes. He is sentenced to live out his days in a cell in the dungeons. He is consoled by his adoptive mother and Odin’s wife, Frigga who tells him that she still considers him a son. This settles deep with Loki, who looks like all he needs is a hug. We are then greeted by the familiar faces of Sif (Jamie Alexander), Volstagg (Ray Stevenson), Fandral (new-comer Zachery Levi. *Note* Fandral had been previously played by Once Upon a Time’s Josh Dallas, but due to commitments to the television show, he was unable to film Thor 2 and the role went to Levi), and Hogun (Tadanobu Asano) who are all engaged in battle. I won’t go into too much detail with this scene as it’s just introductions, but long story short: Thor (Chris Hemsworth) comes in and saves the day. They take their enemies as prisoners and return to Asgard. 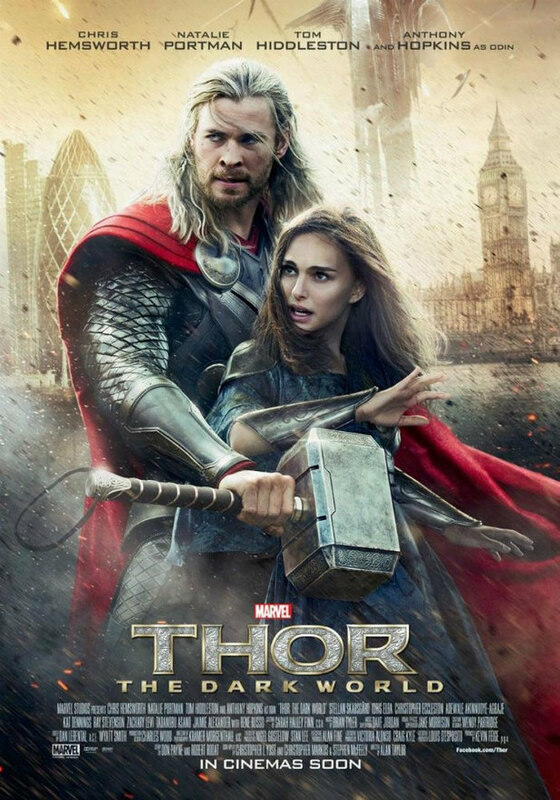 There we learn that Thor has been going to the Bifrost to keep an eye on his human love, Jane Foster (Natalie Portman), for the past 2 years. Meanwhile on earth Jane and Darcy (Kat Dennings) are in London, England. They’ve been studying patterns in space, when they discover an anomaly. They discover that the anomaly is a worm hole created by an astrological event called The Convergence. Eventually the pair meets up with Darcy’s intern Ian (Jonathan Howard) and the trio makes their way to the location, which is an abandoned building, of the anomaly that the equipment picks up. While the group is investigating the anomaly, Jane recognizes the readings on her equipment. The last time she had seen these readings was when she first met Thor after he was cast out of Asgard by Odin. Excited, because she hasn’t seen the god of thunder for two years, Jane goes to find Thor, but instead she is sucked into a worm hole and dropped off in a cave-like place in another realm. And that, my friends, is just the beginning. The rest of the film focuses on Thor protecting Jane (as well as the 9 realms) and keeping the Aether away from Malekith and his Dark Elves. Though it’s not as simple as it sounds; Malekith does anything and everything to obtain the Aether, desperate Thor recruits Loki for help. Thor: The Dark World is full of adventure, action, and hilarious one liners delivered flawlessly by Loki. Some things to keep in mind when seeing this film: As in true Marvel fashion, look for Marvel creator Stan Lee. In every Marvel film he’s got a cameo in which he delivers a funny line, this one is one of his best! Remember the Bruce Banner (The Hulk)’s cameo in Iron Man 3? Keep an eye out for another Avenger. And last but not least, stay all the way till the end. There are two scenes after the credits. The first is appears after artistic credits and the second is after the scrolling credits. Both may have some important information to do with future Marvel films. I absolutely loved this movie and I can’t wait to see what Marvel has planned for us next, in Captain America: Winter Soldier (which premiers April 2014)! Can’t wait for Captain America, but want more fun and adventure from the Marvel Universe? Check out Marvel’s Agents of SHIELD on Tuesday nights 8/7c on ABC.